WOW! Right now on Amazon you can get the Supernatural Recipes For Halloween - 40 Gruesome Recipes (Kindle Edition) for only $0.99! 40 Gruesome Recipes Inside - PLUS! 10 FREE Pumpkin Carving Stencils! 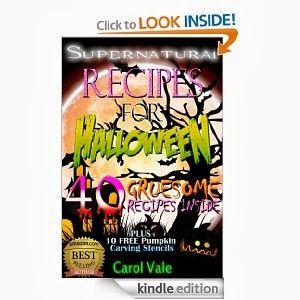 Supernatural Recipes for Halloween is a book written by Best Selling Author Carol Vale for the person who loves celebrating Halloween with fun and scary food. If you love to celebrate the scary season with a party or just having friends over for fun then this book is for you. Don't have a Halloween party with just ordinary cake and food. Make your Halloween special with some scary Halloween treats that taste delicious that your friends and family will love. If you love "Halloween Food" then you will love this cookbook. Don't let your Halloween party be frightening for the wrong reasons. Make a party that will be talked about for months to come.